Eagle Community CU shares how a backpack drive built team comradery, grew its social media presence and engaged members. 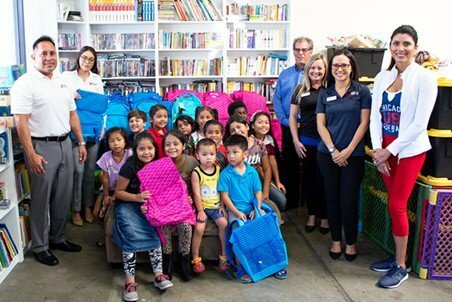 The delivery of 50 backpacks with school supplies takes place at Connecting Hands in Placentia, Calif., on Sept. 12. In addition to the students, six adults are pictured from left to right: Eagle Community CU employees Albert Herrera, Jessica Mares, Scott Rains (president/CEO), Tammy Perez and Karla Davis, and Connecting Hands Founder Roxanne Day. One of the best ways to engage members is to keep things fresh. So when our credit union decided to repeat one of its most successful community give-back programs this year, we knew there had to be a twist.